Large fishing boats use voluminous trawl nets, longlines miles in length, and other industrial gear to catch fish on the high seas, which can destroy habitats and kill other sea life. The jury is in on marine reserves: They work. 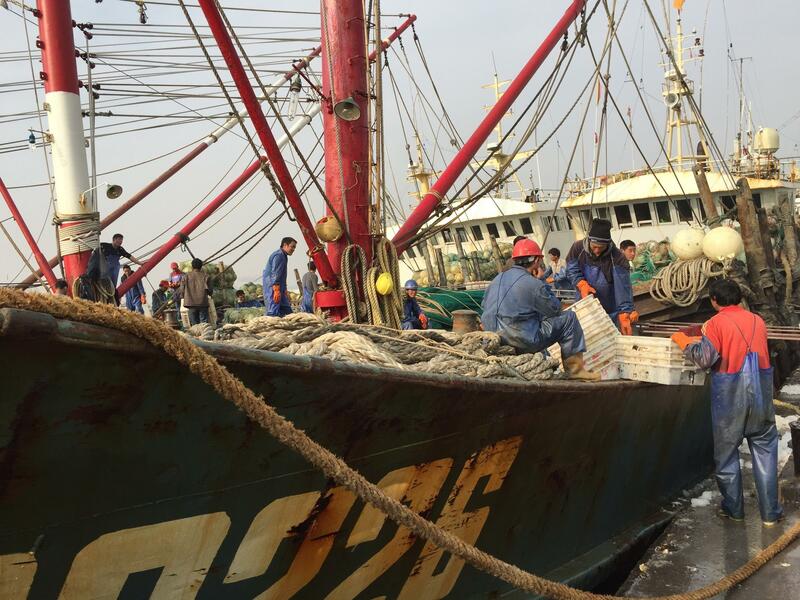 Research has repeatedly shown that fish numbers quickly climb following well-enforced fishing bans, creating tangible benefits for fishers who work the surrounding waters. In fact, many experts believe fishing will only be sustainable if marine reserves are expanded significantly. That's why some activists and scientists are now discussing the idea of creating a marine reserve so big it would cover most of the ocean. Specifically, they want fishing banned in international waters. Also called the high seas, international waters include all parts of the ocean 200 miles or more from sovereign land. That's about 58 percent of the ocean's surface. In this largely unregulated area, fishing boats use voluminous trawl nets, longlines miles in length, and other industrial gear to catch migrating tunas and billfishes, sharks, and seafloor species like toothfish, usually sold as Chilean sea bass. The environmental impact of these fisheries can be devastating. Deep-sea trawling destroys seafloor habitats, including ancient corals, while killing many creatures that are ultimately discarded. Meanwhile, the total contribution to the world's food supply from these fisheries is negligible, catch records have shown. Proponents say a fishing ban could be an effective way to protect depleted species and ultimately create more fish in coastal waters, where fishers could still deploy hooks and nets. University of British Columbia fisheries professor Daniel Pauly, who has studied high-seas fisheries for years, supports the idea of a ban and says it would produce a variety of economic and ecological benefits. "Our work has shown the global catch could actually be greater with a high-seas ban, and the catch would be more evenly distributed," Pauly says. He notes that only a handful of nations catch most of the fish in the high seas, especially Japan, South Korea, Taiwan and Spain. "They have a monopoly on fishing in the high seas, which should belong to everybody," he says. He asserts that, because most species in international waters at some point migrate through coastal zones, a ban would not necessarily prevent these fish from being caught, but it would give every nation — even those without long-distance fishing fleets — a fairer chance to catch them. Nor would a high-seas fishing ban impact global food security, says Laurenne Schiller, a Ph.D. student and researcher at Dalhousie University in Nova Scotia, Canada. Schiller led a recent study showing that high-seas fisheries produce just 4.2 percent of the global ocean fish catch. "If we stopped catching and eating fish from the high seas, it wouldn't have a large overall impact on global food security," Schiller says. The discussion of a high-seas ban began several years ago, but is gaining rapid momentum now as member states of the United Nations convene in New York City to negotiate a treaty on protecting high-seas biodiversity from industrial activity, including fishing. While a ban is not explicitly on the agenda, that's what scientists and sustainable fisheries advocates are hoping could eventually come out of the meeting, scheduled as the first of four biodiversity summits to be held over a two-year period. Matthew Gianni, co-founder and political policy advisor for the Deep Sea Conservation Coalition, has been attending the summit. He says all nations participating in the discussion "seem to be onboard" with the summit's objectives with the exception of Russia, which he says "has been signaling reluctance." Gianni and other advocates see the meeting as possibly the first step toward creating large marine reserves, if not a full closure to fishing in the high seas. But banning fishing in those waters is not a simple proposition. While the surveillance technology needed to enforce fishing regulations in the middle of the ocean already exists, some experts doubt there is political will to implement a ban. Ocean activist and researcher Carl Safina says he thinks a high-seas fishing ban is a great idea, but "totally unrealistic on a human-dominated planet that's expecting 2 billion more mouths" to feed. He says he doesn't believe there will be enough support by world governments to enact such a ban. Safina agrees that the high seas need more protection and a better system for creating and enforcing fishing laws. "Fishing might then conceivably be better regulated," he says. "The idea of a ban — I don't see that happening." Schiller, too, says it could be logistically very challenging. "If you want to turn the high seas into one marine reserve, you would basically need every single country in the United Nations to say yes to that, and if one country says they don't agree to this, that the high seas are much too important for their GDP or national food security, then they could veto the whole thing," she says. A 2014 paper published in the journal PLOS Biology showed that a high-seas fishing closure would dramatically increase fish populations in protected areas and, through what scientists often term a "spillover" effect, ultimately allow fishers in coastal waters to catch more. The authors of that paper, Christopher Costello, a scientist at the University of California at Santa Barbara, and Crow White, an assistant professor of marine sciences at the California Polytechnic State University, in San Luis Obispo, concluded that a high-seas fishing ban would increase the total biomass of some species by 150 percent, would boost catches in coastal waters by 30 percent and double fishers' profit margins. "You'd ultimately have more fish, and more countries would be able to catch them," not just the handful that now dominate the high seas, Costello says. Some marine reserves already exist in international waters. Gianni says some deep-water seamounts where fish aggregate and where ancient coral beds grow have been protected from destructive bottom trawling through national agreements. More such reserves are necessary, he says, and Gianni believes the current discussions in New York "will help focus attention on what's wrong with these fisheries." New Zealand and Japan, he says, are the world's leaders in deep-sea trawling. "That deep-water trawling really needs to stop, irrespective of what happens with the United Nations biodiversity talks," he says. While some experts have suggested that it might be politically easier to establish smaller marine reserves on the high seas rather than ban all fishing at once, others argue that surveillance and enforcement actually gets easier as a reserve gets larger. "If you have a confusing mix of closed and opened places, then there is no way ... you could enforce it," Pauly says. He agrees that starting relatively small, with the placement of big marine reserves in the middle of the ocean, might be necessary. Eventually, though, he says he wants all high-seas fishing shut down — and the way Pauly sees it, the wheels are already turning toward an eventual ban. "What's amazing to me is that five years ago nobody thought about this, or talked about it," he says. "Now, it's on the agenda and the U.N. is considering it."